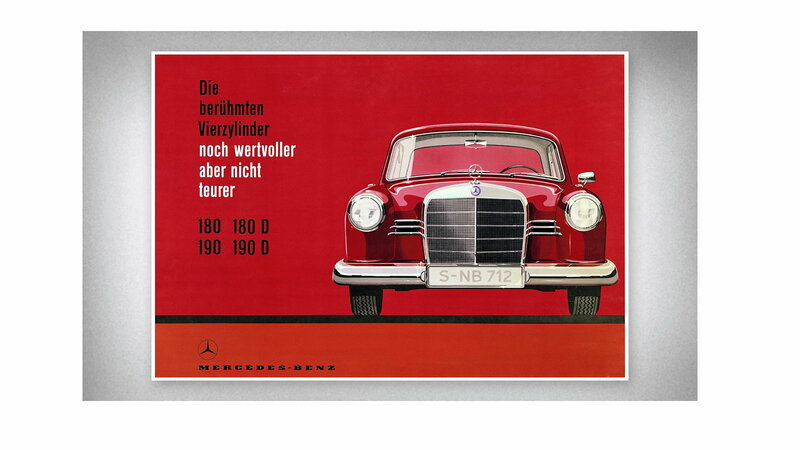 Mercedes-Benz knows that their audience is a classy group and the print ads they have could almost be art. Enjoy these slides and play a fun game by visualizing these without copy on them to see these hanging up in a gallery. This vintage ad comes to us from 1951 French periodical. 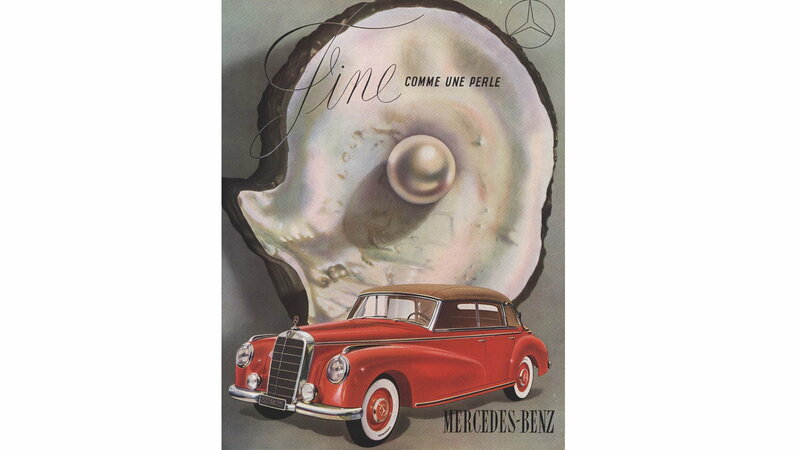 The image showed readers that the Mercedes-Benz was not just as beautiful as a pearl, but also took the time to be created and, therefore, was more special. At this point, the world had come to know that anything produced by this automobile manufacturer was at a superior level in comfort as well as performance. >>Join the art posing as advertisement conversation right here in MB World Forum. 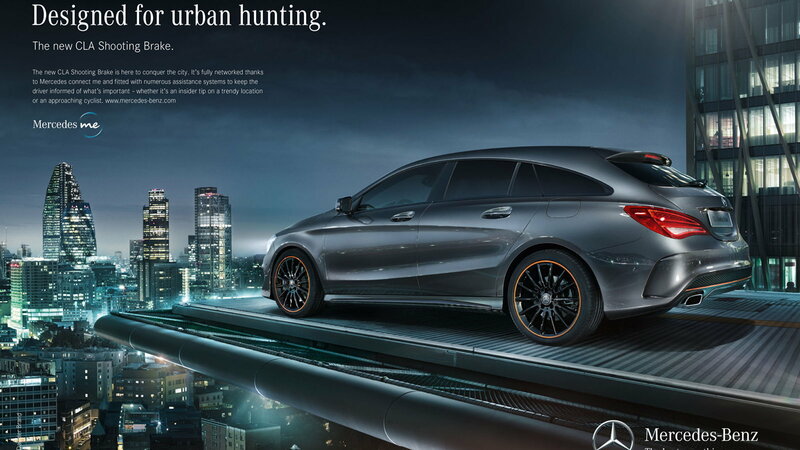 Watching over the city like a vigilant protector, the CLA Shooting Brake watches the bustling nightlife below. The CLA isn't up there looking to part out street justice. Upon unbeknownst criminals, it's looking out, according to the ad copy, for trendy new things for you to get into via the numerous assistance systems. This ad for the 180 and 190 models was put out in 1959 to get consumers into showrooms to see what the new features were in these cars. The German on the ad translates to, "even more valuable, but no more expensive." 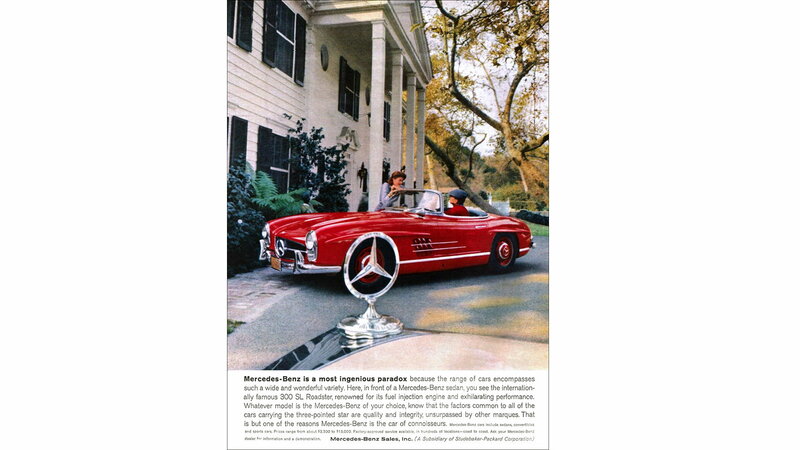 The vocal point of this ad is a blood red 300 SL Roadster with a driver carrying on a casual conversation with a woman. What takes a moment to notice, however, is the sedan that is sitting right in the foreground that we the viewer are seemingly leaning over on. Mercedes-Benz wanted us to know that whatever need we have whether sedan or coupe, that we have a car that is unsurpassed in quality and integrity. 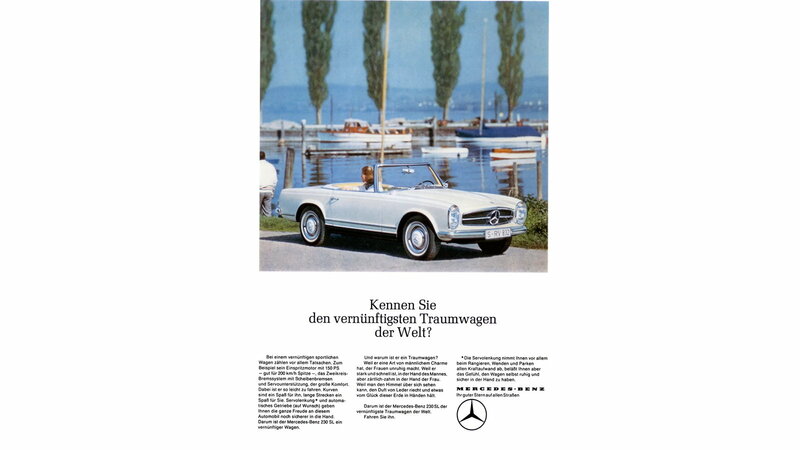 The 230SL Roadster has an advert that read it will never be a sports car because it was too comfortable. However, the car was spunky for its time and was a great grand tourer car that would soak up the miles. Having the SL parked at the harbor showed prospective owners the type of company they'd be in after purchasing one. That even if you didn't own a boat, you could become friends with someone who does. 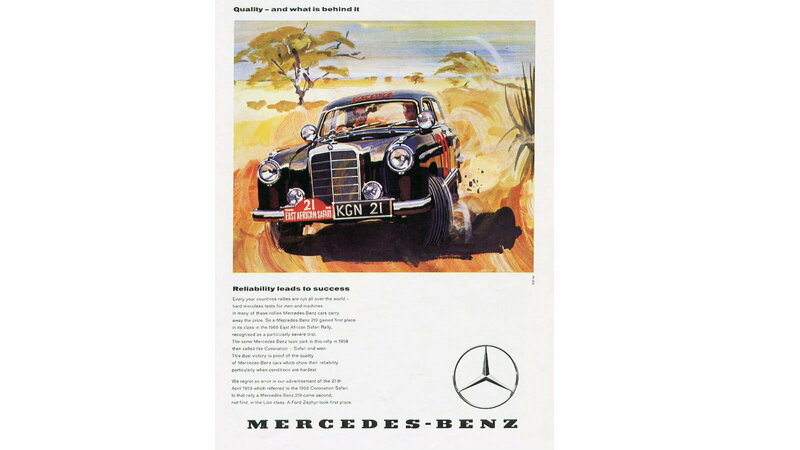 This ad depicts a 219 overtaking the competition in a turn during the 1950 Safari Rally. The race was a particularly nasty one; where cars had not only a punishing course but the merciless heat to content with. The copy states that this same car ran in the 1959 Coronation Safari Rally and won again. If you want not only reliability but race proven power, then the 219 was the car to have at that time. In 1959, Mercedes-Benz had this ad which expresses the sheer easy and contentment that one can have sitting beside their car. 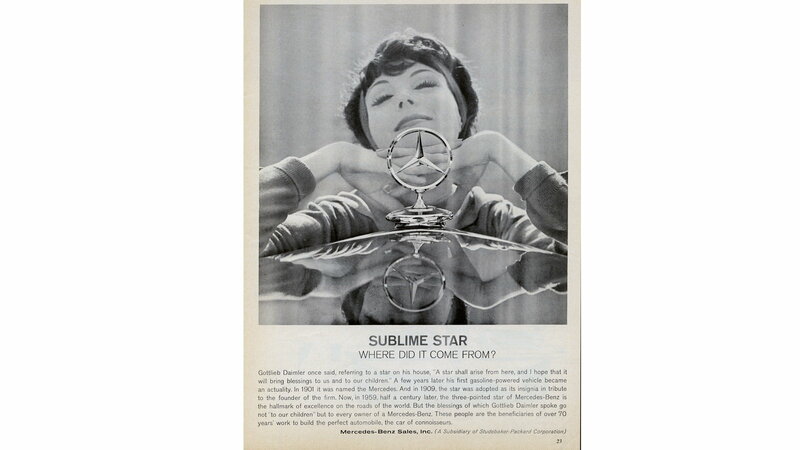 This was put out half a century after Gottlieb Daimler looked upon a star over his house and proclaimed that "A Star shall arise from here...."
For information on maintenance and repairs of your C-Class or E-Class, visit our how-to section by clicking here.